In a previous research namely "Pola Konsumsi Remaja (SMA/ SMK) dalam Menggunakan Internet atau Media Baru" there were 4 important factors that could be put forward, namely: Parental Education, Devices, Costs and Places to access the Internet. From these four aspects, no analysis has been carried out that connects the four aspects. Even though it is important to know whether high school SMA/ SMK) students use high or low levels. This research is a follow-up study from previous research, the purpose is to see whether the variables that have a significant influence on the level of internet use are carried out by high school (SMA/SMK) students. The approach used in this study is a quantitative approach with an explanatory method. The unit of analysis in this study is the influence of parental education, tools, costs, and internet access on the level of internet use by high school / vocational children around Salatiga. The population used in this study were 5 high school / vocational schools around Salatiga, totaling 5,617 students. The sample in this study was determined by the Slovin formula, obtained 374 respondents as samples and the margin of error was 5%. Data collection using questionnaire given to 374 students. The results obtained are that parents' education and devices contribute significantly to the location / place. The magnitude of the contribution of parents and device education is (0.509) 2 x 100% = (25.91%) and the remaining 74.09% is a contribution from other variables out of variable education of parents and devices. In addition, parental education (X1) and costs (X3) also contribute significantly to the level of internet usage. Bagus Pancaputra. 2003. 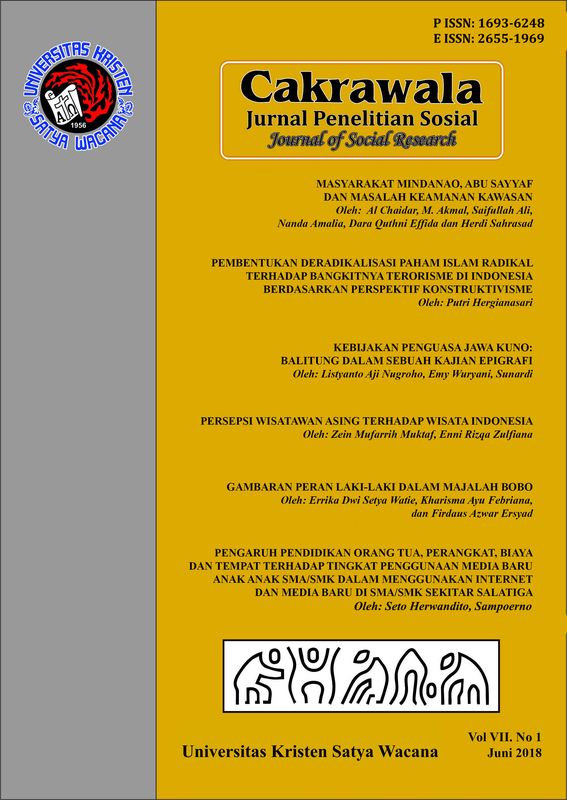 ”Pemanfaatan internet oleh peneliti Badan Penelitian dan Pengembangan Pertanian di Bogor.” Jurnal Perpustakaan Pertanian, Vol.12, No. 2. Dillon, W.R. and M. Goldstein. 1984. Multivariate Analysis Methods and Applications. John Willey & Sons Inc, New York. Flew, Terry, 2005. New Media: An Introduction (2nd Edition). Oxford: Oxford University Press. Gujarati, D. 2007. Ekonometrika Dasar. Alih bahasa : Sumarno Zain. Jakarta: Erlangga. Terjemahan dari : Basic Econometrics. Kerlinger, F.N., and Pedhazur, E.J. 1973. Multiple Regression in Behavioral Research. Newyork University. Purwanto, N. 1990. Psikologi Pendidikan. PT Remaja Rosdakarya. Jakarta. Rutherford, R.D. 1993. Statistical Model For Causal Analysis. John Wiley & Sons Inc, New York. Sarwono, J. 2012. Path Analysis dengan SPSS: Teori, Aplikasi, Prosedur Analisis untuk Riset Skripsi, Tesis, dan Disertasi. Alex Media Komputido. Jakarta. Slameto. 2003. Belajar dan Faktor-Faktor yang Mempengaruhinya. PT Rineka Cipta. Jakarta. Supranto, J. 2004. Ekonometri Buku Kesatu. Ghalia Indonesia. Jakarta. Supranto, J. 2005. Ekonometri Buku Kedua. Ghalia Indonesia. Jakarta. The Habibie Center, 2010. Cerdas Bermedia untuk Toleransi: Modul dan Laporan Kegiatan. Jakarta: The Habibie Center. Wilson, Carolyn, 2011. Media and Information Literacy: Curriculum for Teachers. Paris: UNESCO. YPMA, 2011. Memahami Interaksi Remaja dengan Internet. Jakarta: YPMA. Digital & Education, Volume 1 (2), 2009. URL: http://www.digitalcultureandeducation.com/cms/. Diakses 6 Juni 2012.